I have always admired Godzilla from afar. the Kaiju genre is something that intrigued me from a young age, but much to my shame, I could just never get past how all the monsters just looked like guys in rubber suits. Which is pretty damn hypocritical of me considering how much I adored Power Rangers and a child. 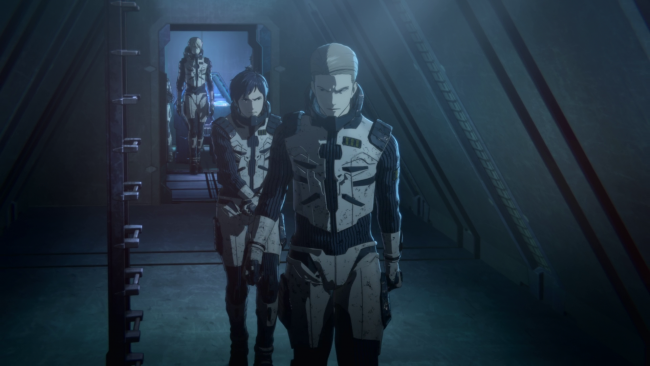 It even took me a while to actually sit myself down and watch the first part of Netflix’s computer animated Godzilla trilogy: Planet of Monsters. I’ll be up front with you, I couldn’t say I have the most classical fandom when it comes to the franchise. I mean, Roland Emmerich’s 1998 Godzilla is one of my guilty pleasures. I am fully aware of how terrible it is, how it holds much more reverence to Jurassic Park than it does the franchise it is named for. But it just fills me with a warm and fuzzy feeling of my childhood. To my further shame, I have gone back and attempted to watch some of the original Godzilla movies, including the very first 1954 movie, as well as 1964’s Mothra vs. Godzilla. I ended up struggling to get through them both. Maybe it’s their age, maybe I like the idea of the genre more than the reality of it. But I’d be damned if I didn’t look at this movie on Netflix all last year and feel guilty I hadn’t watched it. The movie begins on a huge spacecraft orbiting an aggressive looking planet. Humanity has been out searching for a new home for the past 20 years. Terrorised by Godzilla to the point they were forced to flee the planet altogether. Before that though, two alien races appeared before humanity, a religious race of space-elves and the technically able race of space-tough guys. Even together, the collective races were unable to put a stop to the rampaging kaiju and eventually ran together in search of a new home. Now, the raft on which the humanoids have bet all their hopes is run down, dwindling of its resources and scarcely able to support the merger population it holds. It’s here we’re introduced to our main character: Captain Haruo Sakaki, who is threatening to blow himself up along with a good portion of the ship. Sakaki is pressuring the leadership to return to Earth while anonymously publishing research data detailing weak spots he has discovered on the Godzilla monster that forced them to leave Earth while he was still a child. With little other option and under the threat of further terrorist acts, the leadership decide returning to Earth is their best option. The hope being that in the time they’ve been gone, thanks to the time dilation involved in faster that light speed travel, that Godzilla might have died by now. When they return, they discover 20,000 years have passed, and it quickly becomes apparent that Godzilla is certainly not dead. Much of the movie’s story is driven forward by the mystery of what Earth after so much time has passed, and how the last bastion of humanity could possibly defeat it, when only at a fraction of the strength they were when still on planet. The early parts of the story are a moody and atmospheric tale about humanity at the end of its rope. Once the story moves to Earth however, it becomes more of a military story. There were shades of other, better stories that came through pretty strongly mind my mind while I was watching this. It reminded me of Battlestar Galactica, Attack on Titan and the Quarian/Geth parts of the Mass Effect trilogy. Like those, there was a real sense of desperation, which was well conveyed during the dark and confined scenes that took place within the spacecraft, as humanity huddles together in dimly lit corners. The story becomes much less effecting once we arrive on Earth. While characters are endlessly commenting on the changes to the atmosphere and terrain on this older Earth, none of that really shines through based on what they’re showing on screen. The scenes on Earth take place in hostile jungles and vast barren wastelands. 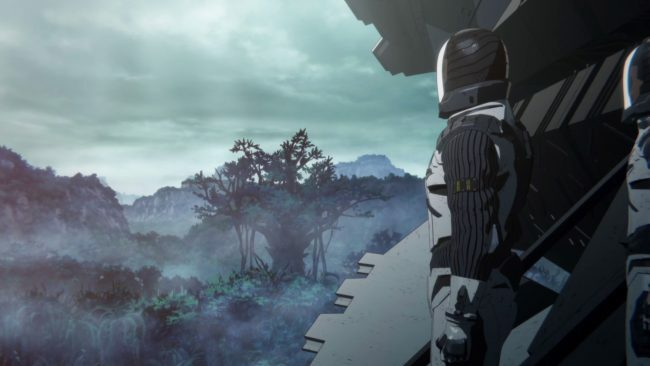 The movie wants to make you feel a sense of loss and shock at the poor shape Earth is in, and yet, it’s nigh unrecognisable as anything that couldn’t just be an alien planet. The idea behind the movie is an intriguing one, but it puts all its weight behind the idea that we should feel despair for these people and their ruined planet. 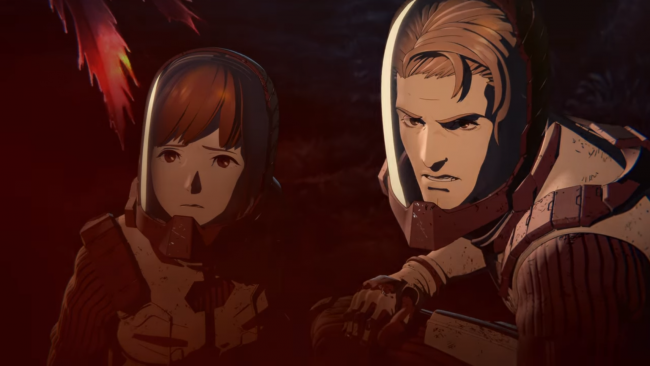 The appropriate emotion fails to trigger in me because there aren’t really any individual characters to put a human face on the plight. The problems are mostly painted onto crowds of people and it inherently makes it difficult to feel a strong sympathy for them when you can’t pluck an individual and forge a connection through a human story. It feels like a story written from a textbook. For a digitally rendered piece of animation, the animation in this movie feels wildly inconsistent to me. 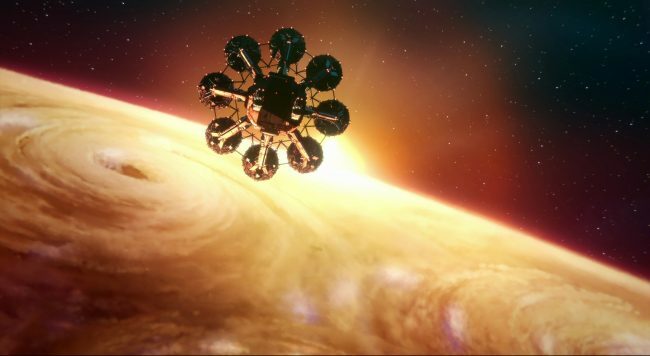 The scenes that take place in space are impressive. The spaceship’s interior is appropriately dingy and depressing, to help portray the desperation of humanity. And yet it’s filled with all these stiff dolls that move they’re at half the frame-rate of the rest of the movie. The obvious creative elbow grease when into the designs for the military vehicles and environments the movie takes place in. Which are beautifully rendered, but the vast, featureless plains the battles with Godzilla don’t add to the scale or weight of the action on screen. Especially when the staple for the genre are cityscapes that help scale the monsters wreaking havoc upon humanity. The final battle with the monster takes place in a featureless, rocky wasteland that lacks any real character, this is compounded by the monster itself. In this movie, Godzilla himself is a lumbering, slow creature, always swarmed by these hyper dynamic flying bikes. I realise there was most likely a conscious choice behind Godzilla’s movements, one that is to invoke the feeling of a man in a large bulky suit, however it ends up being a counter intuitive choice for the sake of the movie. Godzilla feels sluggish and hardly moves compared to everything around him, making him one of the least interesting things about the movie. For an entirely animated feature, I’m surprised at how lacking it ends up being in terms of its animation. Especially given the potential to do pretty much anything in the medium. 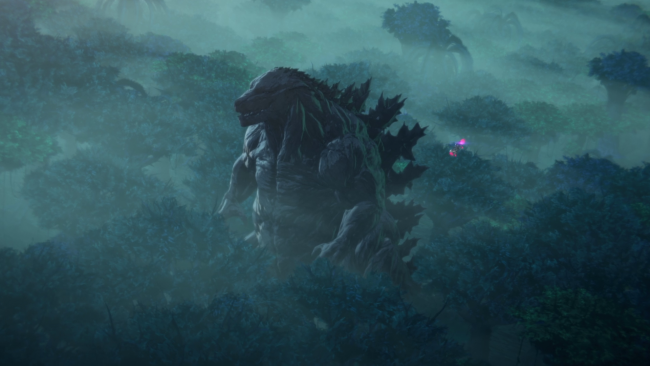 Godzilla’s Scale is lost on me when he just stands in a vast open plain, occasionally using his atomic breath, coupled with a real lack of any dynamic movement, it’s a real bummer. One that makes me question the priorities of the animators and directors when making this. All of my issues, those with the animation and the design would have been easily forgiven if there had been some human element to this story. Some characters to embody the strife and hardship humanity were going through and really put a face on the stakes of the movie. But with so much weight thrown behind explaining the backstory for this world they’ve created, and the current situation, quite possibly the most important factor of the movie is nearly absent completely. As they all regurgitated exposition, I found it was difficult to really get a feel for any of the characters nor feel engaged with them. Even our main character, Sakaki has very little in terms of development in the movie. He’s an angry man whose hatred for Godzilla seemingly burns more brightly than any other human alive. That makes him the sole savour for humanity, why exactly. It’s never really talked about. The fact that he had an idea nobody else did is his primary defining characteristic. He, like every other character are simple, cardboard cutouts, there to fill the role of getting the movie to where it needs to go. Their relationships and development as people is something that it touched upon but never expanded upon in any meaningful way. 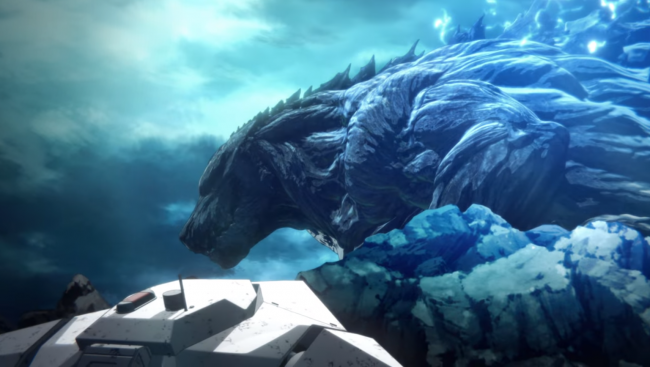 The metaphor of being built out of craft parts isn’t countered by the fact that the animation really drops the ball when it comes to human character’s movements, which feel stiffer and more robotic than even Godzilla. Even the most simple premise can turn into a fantastic piece of storytelling if the characters are interesting and compelling. Look at Bumblebee, a movie from a franchise that used to make light of its human characters and focused too much on action and spectacle, once it settled down and gave a compelling human story, the prequel became something much more. Honestly, I should have taken my requirement of three sittings to get through this movie as a sign that I probably wasn’t going to enjoy it come the end. 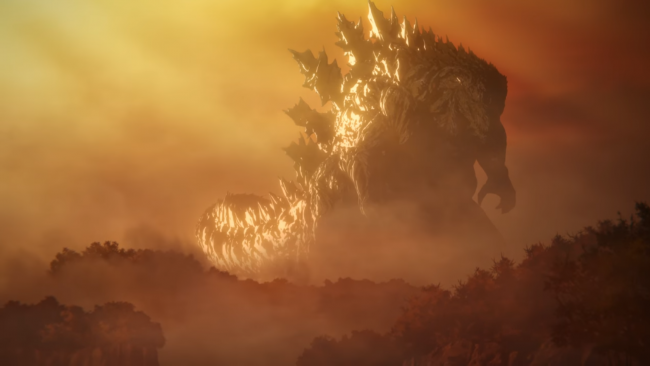 The most compelling thing about it was the ending twist when the original Godzilla emerges from the ground, far larger than any on-screen Godzilla seen before. Oh, um, spoilers I guess. Again though, most of the impact of this monster is lost when you have no recognisable structure or landmark to compare it to. I am undecided whether or not I’m going to continue and watch the other two movies that follow this one. With a new, American made Godzilla movie on the horizon, my interest might be piqued enough to give part 2 a try and see if I can get something more out of it. A lot of this movie was let down by its animation and uninteresting characters. I’m sure there is a lot to do with the style of music and movement of the monster that is lost on me as a simple Gaijin with limited exposure to the breadth of history within the genre. But with so many Kaiju showing up in movies and anime lately, this feels like a nothing movie by comparison. Which is a shame to be honest. 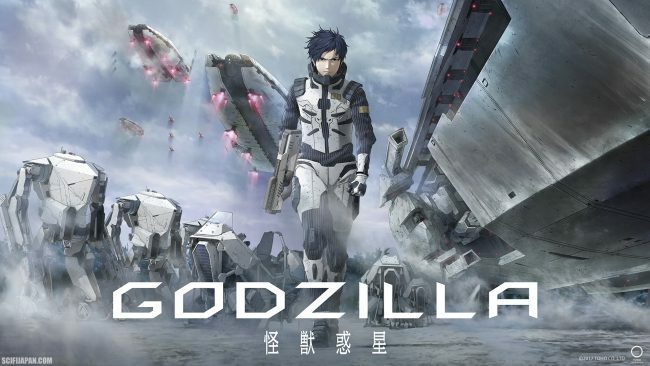 Posted on January 16, 2019 January 15, 2019 by WooderonPosted in Looking Back At:, MoviesTagged computer anime, godzilla, kaiju, Netflix, planet of monsters, toho. Previous Previous post: JoJo’s Bizarre Adventure: Golden Wind Episode 14 – Express Train to Florence – Turtle Power!